What is Windows Live Mail? 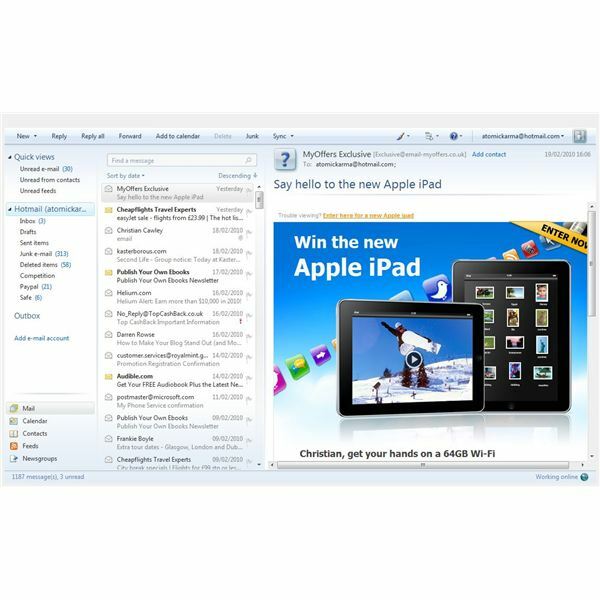 Windows Live Mail is the free email client that ships with Windows Live Essentials, the latest version of which is labelled Windows Live Essentials 2011. A free and functional alternative to Microsoft Outlook, Windows Live Mail features support for multiple email account types (although there is no exchange support), RSS feeds, Usenet and calendar and contacts management utility. For users with a Hotmail or Windows Live email account, these features can prove extremely useful. However, no software is perfect; from time to time, Windows Live Mail errors occur. Luckily, the majority of these can be easily resolved. As with all well-written software, Windows Live Mail features various error codes that can be used for troubleshooting issues. While no one wants to see error messages, these are vital for tracking the actual cause of the problem, which in many cases might not have anything to do with the application. For instance the IXP_E_FAILED_TO_CONNECT error indicates that Windows Live Mail was unable to connect to the mail server. This can be resolved [LINK] by checking the correct authentication details, which can be adjusted by right-clicking your mailbox and selecting Properties > General. As you can see from the IXP_E_FAILED_TO_CONNECT message, the text portion of the error is virtually plain English, so you should be able to get a good idea of the problem when an error message is displayed. Different error messages might be received relating to your preferred email account setup depending on whether you are using the POP or IMAP email protocols, or trying to access a Usenet (NNTP) account. Problems might also arise with SMTP, the protocol used for sending messages. Common Windows Live Mail problems can be resolved by carefully reading the error message and checking the area that it related to. This might mean checking account details, discarding old and unwanted emails, making regular backups of your mailbox and if necessary, reinstalling the email client. While most Windows Live Mail problems are relatively to trace thanks to the friendly error messages, the same is not true of all faults that the application might develop. As such you might opt to take the easy way out and repair the software. Before proceeding, make sure that Windows Live Mail is completely shut down – exit the software in the usual way, but if this fails right-click the Windows task bar and select Start Task Manager, then find Windows Live Mail (possibly listed as wlmail.exe) and select End Process. In order to initiate a repair of Windows Live Mail, browse to Start > Control Panel > Programs > Uninstall a program and wait for the list to build. Once this has completed, find Windows Live Essentials in the list and double-click to begin the uninstall/repair wizard. You will be presented with two options – Remove one of more Windows Live programs or Repair all Windows Live programs. In the first instance you should try the second option, as this should resolve the issue – however bear in mind that that removing the application and then reinstalling it later might be an option. When you select Repair all Windows Live programs the wizard will proceed to repair any problems that it detects.